There is a buzz in the air around this time of year at Wabash College. 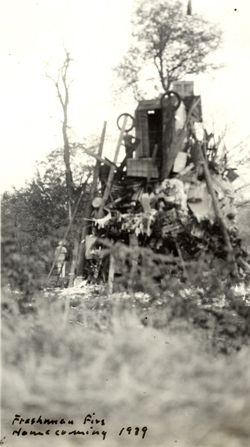 It could be the hum of saws and the thump of hammers as the homecoming “floats” come to life. It could the growl of beefy football players working out their game day strategies, or it could be the sound of the pledge classes as they practice “Dear Old Wabash” for Chapel Sing. Whatever it is, this buzz is part of what I love so much about working here on campus. It is the renewal of old traditions, it is the reminder of homecomings past and it is the knowledge that we are all a part of what Byron Trippet called the “tapestry that is the life of the college.” Homecoming is a time when the threads of another year are added to all those of years past. A beautiful pattern is formed and yet never finished. Ah, homecoming …. 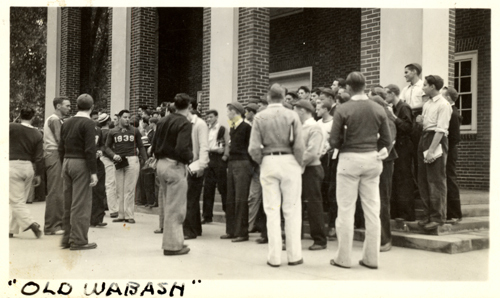 Here are some pics from the 1939 Homecoming, taken by Robert W. Schaller [W1942]. 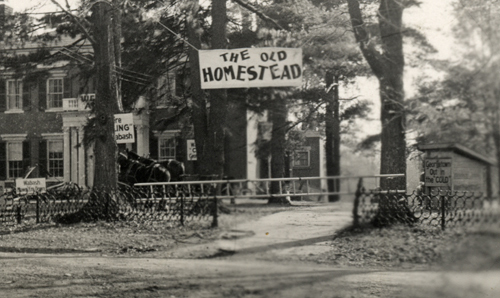 I might also add that the “Old Homestead” is the Crawford house, home to generations of Lambda Chi Alpha brothers. Sometimes I run across an image that is so striking it must be shared and this image is one of those. 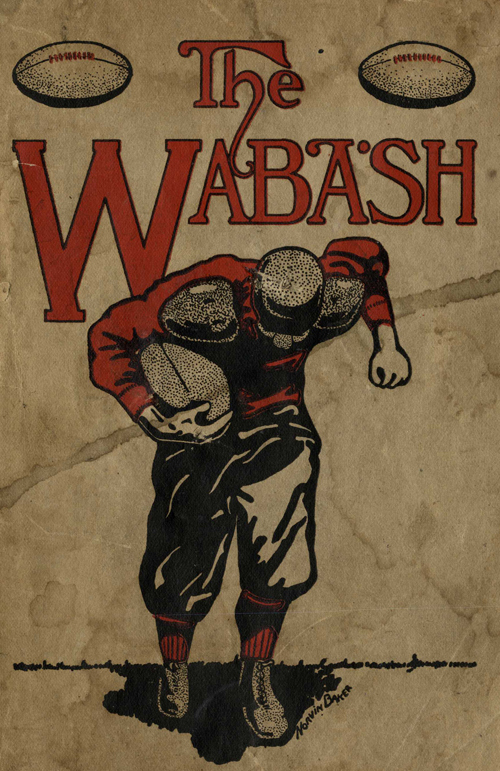 This is the cover of the December 1916 Wabash Magazine dedicated to football. In this issue there are action pictures of the team. Individual profiles of the team members and the coach, as well as a great photo of “Ben” the Little Giant mascot. The team of 1916 went seven and two overall. The two were pretty big losses to Notre Dame (coached by our former coach and inventor of the forward pass, Jesse Harper) and Indiana University. The big game of the year, then as now, was with DePauw and at that time this was played in Indianapolis. With the Interurban train fare from Crawfordsville to Indy so low, students were easily transported to the city. There was a parade through downtown Indianapolis before the big game, which we won by a score of 26 to 13. In another little history note, on the last page of this football issue there is a photo of the players getting ready which carries the title, “The Last Day in the Old Gym.” This is because the Old Barn, as the first gym was known, was ready to be demolished to make room for the “new” gymnasium – which we now call the Armory. I hope you enjoyed this lovely image as much as I did! 1. Veteran’s Village – a.k.a.Mud Hollow which was home to married students in the 50s, early 60s. Later baseball field and now the new soccer complex. 2. Kingery Hall – Served as preparatory school, later as a private home and then as an infirmary and dormitory. Kingery took its name from the faculty family who lived there for years. 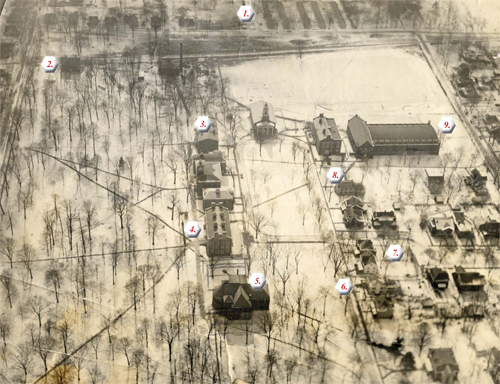 Kingery was destroyed in a storm and this is now the site of the Wabash Center for Teaching and Learning in Theology and religion. 3. Old South Hall – This was the first college building built on this campus and contained a dormitory, Chapel, Library and class room space. Nearly completed when it burned in 1838, the citizens of Crawfordsville rallied around the college and the building was repaired. Future site of Baxter Hall. 4. Waugh Hall – Built shortly after WWII. Later joined by Thomas Labs and both were demolished to build Hays Hall. 5. Yandes Library – now expanded and re-christened Detchon Hall. Housed the library with the curved portion on the east serving as the reading room. The hall in the middle held stacks rising from the floor to the skylight. 6. Caleb Mills House – same location as now, has never been moved. 7. Mills Place – Faculty housing, former site of Caleb Mills’ orchard and pond. Perfect for ice skating in the winter. 8. Forest Hall – Original college building moved to the first of its on campus locations. Served as the original Scarlet Inn. This site is the future home of the Campus (Sparks) Center and interestingly the current Scarlet Inn.